The Fraternal Order of Police is the world’s largest organization of sworn law enforcement officers, with over 325,000 members in more than 2,100 lodges. We are the voice of those who dedicate their lives to protecting and serving our communities. We are committed to improving the working conditions of law enforcement officers and the safety of those we serve through education, legislation, information, community involvement and employee representation. No one knows the dangers and difficulties faced by today’s police officers better than another officer, and no one knows police officers better than the FOP. Here’s a quick overview of the wide variety of services and benefits that the FOP offers to its members. The FOP maintains an office on Capitol Hill in Washington, D.C., where a full-time professional staff actively lobbies Congress and the administration on the issues most important to rank-and-file law enforcement officers. The National Legislative Program is the most active and comprehensive of any law enforcement organization in Washington, working on behalf of law enforcement officers to ensure that legislation is put into place to improve the lives of officers and their families. 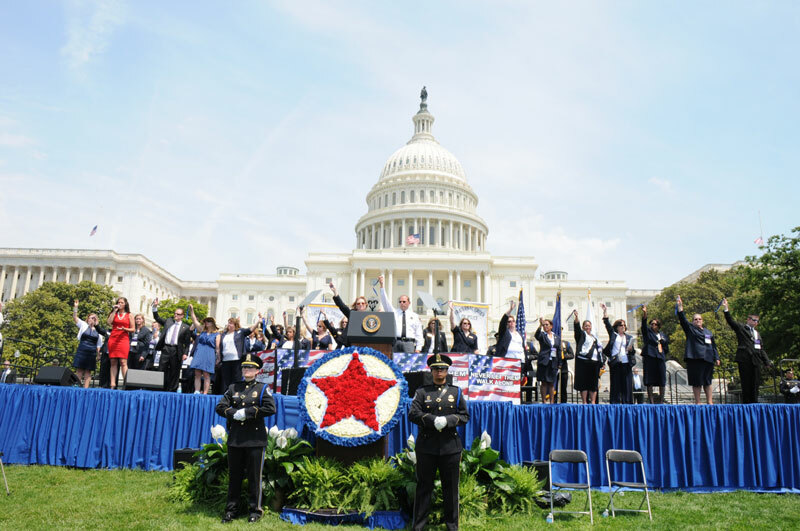 This solemn event, held every year on the U.S. Capitol Lawn in Washington, D.C., on May 15 during National Police Week, honors those who have given their lives in the line of duty and seeks to assuage the grief of families who have lost a loved one. Open to the public, it brings together the expanded law enforcement family: the survivors, officers and friends whom these heroes have left behind. Our national leaders — including the president of the United States, cabinet members, members of Congress and heads of various enforcement agencies — along with major recording artists join tens of thousands of officers to pay tribute to the fallen and to offer words of comfort to their surviving family members. Published four times a year, the FOP Journal is the official publication of the Grand Lodge. Each issue contains reports from the Executive Board and various committees, articles of interest from local lodges and updates on law enforcement labor issues, including progress on legislation from our advocacy center in Washington, D.C. The official online companion to the FOP Journal, the website is open only to members and features an archive of past and current issues of the Journal, expanded articles from the magazine, a product directory, regular sweepstakes, the ability to share your thoughts on articles with other FOP members, and a variety of e-newsletters featuring exclusive new content. The Education Services Committee is responsible for the development and implementation of professional law enforcement training programs and events. Our goal is to maintain the highest standard in providing quality education and excellence in training. We are committed to equipping law enforcement professionals with the necessary skills to enhance their career development and quality of life. In keeping with our continued commitment to effective labor services, the committee also seeks to provide a comprehensive understanding of the complex legislation impacting law enforcement officers — knowledge crucial to establishing protections from unfair labor practices. We have established a training schedule covering a wide spectrum of leadership, labor and legal issues. We also develop on-site custom training events on these and other topics as needed, upon request by either local or State Lodges. For members, local lodges or State Lodges that may not be in a financial position to afford training or other educational experiences, the Grand Lodge provides scholarships to eligible applicants. Recognizing that four-year and graduate degrees are becoming increasingly important for law enforcement career advancement, the FOP collaborates with a select consortium of universities willing to offer members the education they need with a flexible schedule and reasonable cost. Since its inception in 2007, NFOPU has provided hundreds of FOP members with the opportunity to take courses that accommodate the unique requirements of a working law enforcement officer’s schedule. Easter Seals: Helping children and adults with disabilities live better lives is at the heart of Easter Seals’ mission, and the FOP, as an Easter Seals National Corporate Partner, has helped raise funds for 33 years to support the more than one million people with disabilities and their families served by Easter Seals annually. As a result of this long-standing relationship, the FOP’s support for Easter Seals exceeds $15 million in money raised and services provided, making a difference in communities throughout the country. Donate to Easter Seals online at www.easterseals.com and make sure you indicate your FOP affiliation when donating! Law Enforcement Torch Run for Special Olympics: The FOP is committed to helping people with intellectual disabilities learn to achieve and become self-reliant and contributing members of our communities, and to ensuring that they are afforded the same dignity and respect that each of us enjoys and deserves. Please help us by reporting any fundraising events that your lodge has held or donations that your lodge has made to benefit the Torch Run. 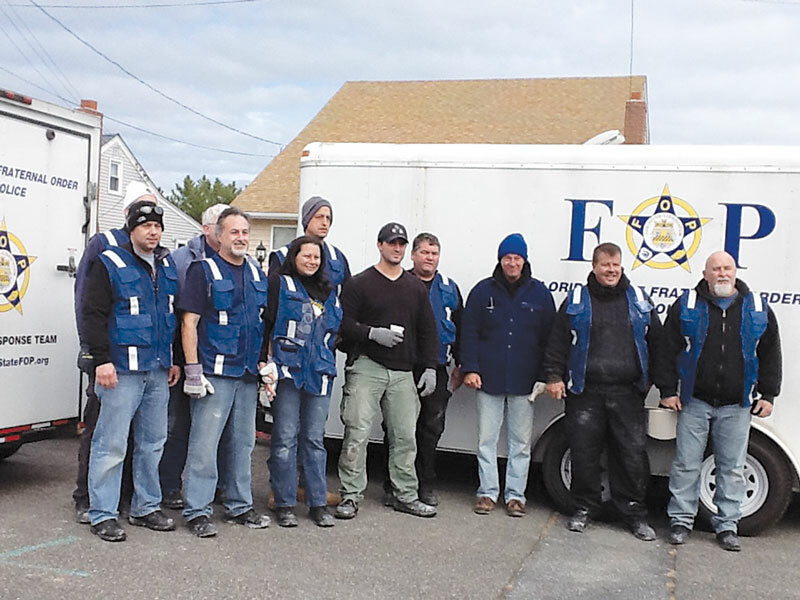 As a nonprofit 501(c)(3) organization, the Fraternal Order of Police Disaster Relief Fund, part of the NFOP Foundation, relies on the generosity of individuals, organizations and corporations and is constantly in need of a steady stream of funds. With our members spread throughout the U.S., Canada and Ireland, weather extremes and disasters are an ever-present danger. Tornados, hurricanes, floods, drought and fire inflict significant damage when they do occur, and we need to be prepared to assist our members in distress. The Fraternal Order of Police is woorking hard at the state level to find additional benefits & Partnerships for our members. 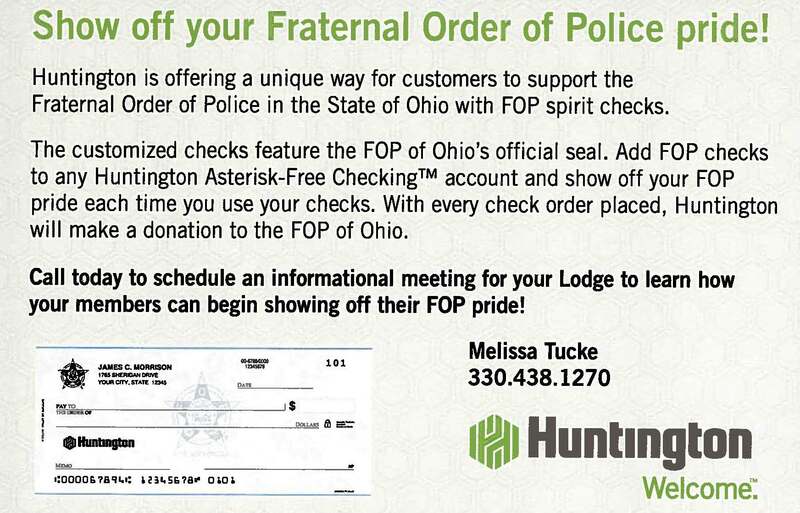 The FOP of Ohio, Inc. has partnered with several providers to offer benefits to our membership. Below is a short but growing list benefits you may find useful. Participation is voluntary, but encouraged. As a member, you’re entitled to a wide range of services and savings from Avis. Before you request your next car rental please contact the FOP for the discount number, call Avis reservations at 1-800-331-1212 and ask for the discounted rate for FOP Ohio members, or log on to the website. Along with all the benefits of Avis' famous "We try harder" service, you also receive complimentary Preferred Service that enables you to bypass the rental counter and go directly to your car for a faster, easier rental experience. To enroll in the program, simply visit www.avisawards.com. Click on the Preferred Service tab and complete the online application. Be sure to add the Avis Worldwide Discount number to the application. The Avis Worldwide Discount number (AWD#) is T166500. Please feel free to share the attachment with you members. Along with all the benefits of Avis' famous "We try harder" service, you also receive complimentary Preferred Service that enables you to bypass the rental counter and go directly to your car for a faster, easier rental experience. To enroll in the program, simply visit www.avisawards.com. Click on Preferred Service tab and complete the online application. Be sure to add your AWD # T166500 to the application. Beacon Financial Group (BFG) has been educating and administering benefits and financial services to individual state FOP’s and law enforcement employees throughout the country for over 10 years. These benefits have been negotiated for FOP members and are not available to those not associated with the FOP. You and your family members are welcome to take advantage of these customized services. 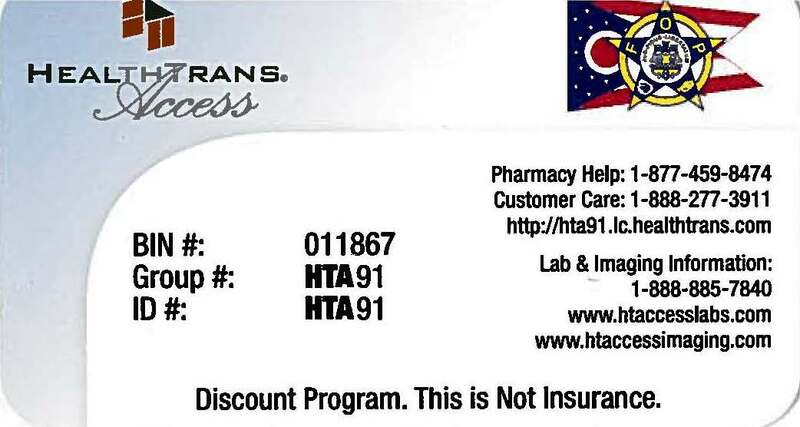 Beacon Financial Group offers the FOP of Ohio members the HealthTrans Access discount prescription card. This card helps people save 10% to 85% on the cost of brand and generic medications. The card also provides discounts of up to 75% on lab and imaging services. The card is accepted at over 58,000 pharmacies nationwide, including national chains, regional chains, and local, privately owned pharmacies. The card can be used by the entire family, and there are no limits on the number of prescriptions. The National FOP and Calibre Press (the leader in law enforcement training) entered into a strategic partnership. The primary purpose of this unique partnership is to provide affordable street survival training solutions to all FOP members. For more information about this partnership and discounts available to FOP members, log into the National FOP website. The FOP of Ohio, through American Hearing Benefits, offers many benefits and discounts. Click Here to go to the American Hearing Benefits website. Get quality protection for your auto and home. Liberty Mutual is pleased to offer FOP of Ohio, Inc. members special savings and personalized coverage.1 Enjoy exceptional service your way: at a local office, by phone, online or via mobile device. We will help ensure you, your family and your valuables are properly protected. Click for a free quote. Please call (800) 835-0894 for a free second opinion on your insurance. The National FOP has an agreement with Nationwide Advantage Mortgage. Wells Fargo Home Mortgage provides great home financing options. Call me today for a complimentary consultation. Through a parternship with YTB Travel, the FOP of Ohio can offer discounted travel to its membership and friends, and when you travel with YTB and the FOP, you help the FOP too. Visit the website and comparision shop. Help the organization that helps you.